In Rio de Janeiro alone, more than 1.1 million tourists came to see the samba parades and dance in samba blocos (street parties). SÃO PAULO, BRAZIL – The city of Rio de Janeiro received more than 1.1 million tourists during the 2017 Carnival and the week-long festivities brought approximately R$3 billion to the city’s economy, according to Riotur (Rio de Janeiro’s Tourism Agency). Carnival bloc in Rio de Janeiro attracts thousands, photo by Akemi Nitahara/Agência Brasil. 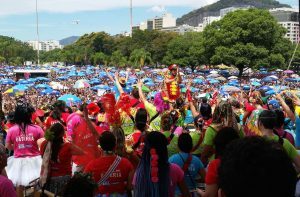 A survey conducted by Riotur with tourists during the two day samba school parade, found that over 94 percent of foreign tourists said they would return to the city and 91.9 percent would recommend Rio to their friends. The highest scores by both foreign tourists and Brazilians from other states were given to the Carnival blocos and parade while tourists complained about security and city cleanliness. Elsewhere in the country the number of tourists and revenues brought by the four-day festivities were also celebrated by Brazil’s Tourism Ministry. According to a survey conducted by the entity with their state partners, Carnival attendance was significantly up this year, helping local economies. “The positive numbers demonstrate how Carnival is an important inductor of national tourism, generating jobs and income. Our expectation is to grow even more and for this we are investing heavily in professional qualification and tourism infrastructure,” Tourism Minister, Marx Beltrão told reporters on Friday, March 3rd. In Salvador, capital of Bahia, more than 600,000 tourists, ten percent of whom were foreigners, came to see what is considered the longest Carnival party in the country, running from February 23rd to March 2nd. In São Paulo the surprise this year was the large number of tourists and party-goers who attended the pre and post Carnival samba blocos. According to the São Paulo Tourism Bureau the number of people attending one of the hundreds of blocs scheduled for the festivities increased by more than 200 percent from last year. Even in Brasilia, where Carnival parties and blocos are not a tradition, more than 1.5 million took to the streets during the festivities, up by 58 percent from last year. I was in Rio De Janeiro, 2013,2014,and 2015. It was the absolute best time I had in my life. I hope and pray that 2018 will be the best that money can buy. I’m also praying that the people of Brazil can come together and keep things safe for tourist that will be visiting your beautiful and amazing country. I’m looking forward to being there and celebrating with everyone. Enjoying everything Rio de Janeiro has to offer.